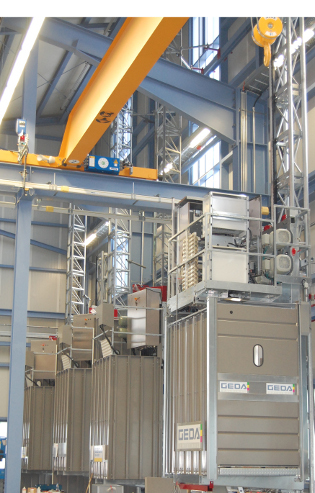 GEDA, the leading global manufacturer of rack and pinion industrial elevator and hoist solutions, has announced the completion and commissioning of its state-of-the-art manufacturing facility in Asbach-Bäumenheim, Germany. The new manufacturing facility provides the capacity for GEDA to meet the growing demand for its large industrial lifts and elevators. Used for industrial, chemical processing, cement manufacturing, cooling tower, bridge pylon and high-rise construction applications, GEDA's lifts are designed to perform well in demanding environments that require lifting to heights up to 400 meters, or 1,300 feet. The lifts and elevators provide safe, efficient vertical lifting solutions for equipment, cargo and personnel. "This investment was necessary so that we can continue to comply with high quality and production standards and meet the increasing demand in the international market. The new facility will enable us to serve our customers that require big lifts for installations and projects even faster. We want to retain our market leadership position and we see great potential here." says GEDA managing director Johann Sailer.The innovative design of the facility incorporates a state-of-the-art production facility with dedicated space for design collaboration with clients and hands-on training for operators. Equipped with the most technologically advanced machinery, the new 36,000 sq. ft. facility addition has the capacity to efficiently manufacture custom lifts to the most demanding requirements, ensuring that GEDA's elevators and lifts meet the quality standards and regulatory requirements required for each application. Materials storage is integrated with production to provide an ideal materials flow to manufacturing, further increasing efficiency. Finished elevators and lifts are dispatched from the adjacent, integrated shipping area. GEDA's quality control features include a 47 ft. high (14.33 m) test tower with five test stations to perform comprehensive testing of designs and the manufactured product. The Asbach-Bäumenheim facility assures that GEDA has the capacity to meet the increasing global demand for its high performance industrial lifts while providing increased efficiency and continued high quality.